What’s Up With Seeding Serena Williams 28th for the U.S. Open? It's been an interesting season for Rafael Soriano. His tenure with the Yankees began with a bizarre press conference in which his own general manager admitted he wasn't in favor of the signing. By the time April rolled around, the Yankees had begun to hype their new dominant one-two punch at the back end of their bullpen. (The April cover of the Yankees game program, which featured Soriano, proudly notes that last year's A.L. 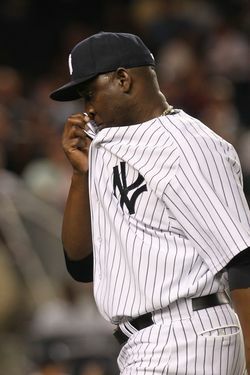 saves leader is now the Yankees' "eighth-inning guy.") But his season got off to a rocky start, and then he spent more than two months on the disabled list. (His ERA at the time: 5.40.) When he came back, David Robertson had stolen his "eighth-inning guy" role, but Soriano began to impress: Before last night, he'd allowed just two hits and one earned run in seven and a third innings since coming off the D.L. And so consider last night something of a step back for Soriano — the kind of bad outing every reliever is bound to have from time to time, but one that won't help him win over any skeptical Yankees fans. Soriano allowed a go-ahead three-run homer to Coco Crisp in the tenth inning last night, and Oakland would go on to win 6–4, and ensure themselves a series victory no matter what happens in this afternoon's series finale. Crisp, by the way, had a big night, collecting four hits, including two homers, and driving in five runs. (Crisp had just five home runs this on the season upon entering the game, and had just five hits in his previous 34 at-bats before last night.) The first of those home runs would come in the top off the first inning of CC Sabathia to give Oakland a 1–0 lead. But Sabathia would hold the A's scoreless after that until the eighth, when after a visit from Joe Girardi, he allowed the tying run to cross home plate on Scott Sizemore's double. Robertson would relieve Sabathia, and Sizemore, too, would score, giving Oakland a 3–2 lead they wouldn't hold for long, as Mark Teixeira led off the eighth with a home run. But the Yankees couldn't push across another run in the eighth, and after Mariano Rivera pitched a 1-2-3 ninth, didn't score in the ninth, either. (By the way, since Rivera's ugly week earlier in the month, he's thrown four perfect innings and struck out seven of the twelve batters he's faced.) But then came Crisp's home run off Soriano, and Nick Swisher's solo home run in the ninth wasn't enough to send A.J. Burnett scrambling for his whipped cream. And so last night's loss, coupled with Boston's win over Texas, drops the Yankees back into second place. Phil Hughes pitches this afternoon as they try to salvage the final game of the series.